From the entrance lobby at the main door two stairs lead down to the newly-refurbished shower room/WC. Upstairs the first floor has two double bedrooms (one with an additional single bed) and an additional shower/WC. Also on the first floor, the kitchen/diner/lounge includes two large settees, a breakfast bar with four high stools (please bear this in mind if you have younger children), oven and hob, microwave, and a dishwasher. There is a wood-burning stove in the lounge for the winter months and electric panel radiators are throughout the other living areas and staircase. The washing machine is in the utility room in the cellar and the private garage can also be accessed via the cellar. The opening to the garage is 174cm tall and 222cm wide - this is large enough for most cars such as Vauxhall Meriva, Mazda 6, Peugeot 308, Ford Focus, but not for particularly tall cars like SUVs. The garage is 560cm long, so long enough for most cars. There is free parking available in the street and in other very nearby streets. Free wi-fi, (high definition) Satellite TV, and Playstation 3 with a selection of games and Blu ray movies. Carcassonne, in South West France, is easily accessible via its own airport with Ryanair flights to London Stansted, Glasgow Prestwick, Liverpool, East Midlands and Bournemouth airport in the UK, Porto in Spain, Dublin and Cork in Ireland, Brussels in Belgium, and Billund in Denmark. Toulouse, Perpignan and Beziers Airports are all a little over an hour away by car with flights to many other European locations. Carcassonne is one of the most popular tourist attractions in France, with its dramatic medieval Cité (listed as a UNESCO World Heritage site in 1997). Walk along the castle ramparts to get fantastic views of Carcassonne and the surrounding countryside, or visit the Castle itself or the historic Cathedral, dating back to the 11th Century. Numerous excellent restaurants and independent high quality shops are within the walls of the medieval Cité, which are a few minutes walk from the house. Two Michelin-starred restaurants are within 400 metres of the house, one of which is in the Cité itself, the other (two-starred) a few minutes walk along the road. For those with a car, historic local villages such as Villemoustaussou and Pennautier are within 15 minutes drive. Slightly further away (about 40 minutes) is Narbonne, and a little over an hour away are Toulouse, Beziers, and Perpignan. Alternatively why not take a train to some of these larger cities, or to the seaside resort of Sete, with its long beachfront. The main shower room has an enormous shower enclosure, with two Grohe shower heads. All areas of the house accessed via stairs. There is a breakfast bar with high stools which are not suitable for young children. There are two showers but no bath. The wood-burning stove in the kitchen/dining area becomes extremely hot and should not be touched when in use. This property enjoys a spectacular location just down the hill from the walls of the old city. It has an exceptionally well-provisioned kitchen, two comfortable bedrooms, and a living area that will accommodate 2-4 people comfortably. Be aware that the local property manager does not speak English, so, if you don’t speak French, there will be communication problems. Great with just a couple problems! Well equipped except needs regular coffee maker. Great location and garage for the car was great. Overall, house was damp; noticed mold on ceiling in entrance way. As we advised before your stay, our house had suffered severe water incursion in the storms that caused the catastrophic floods that devastated the area around Carcassonne less than a week before, and it was touch and go whether it would be habitable for you. In the short period of time they had, our guardians did the best they could to dry the property, but had to wait until there was a significant gap between guests to replace the ceilings etc (it's being done now that you have left!). We did warn you that they had described it as "humid"! The house usually has both the stove top and press type cafetieres, and a spare press should be in the "spares" cupboard in the kitchen (as described in the welcome book). However, as they are glass, presses occasionally get broken. I am sorry that none remained for your visit. We will try to make sure that we have more spares in stock, or investigate metal presses, so that at least one remains at all times! Maybe you can come and stay with us again, to see if we do better next time! The apartment is lovely, Well equipped and very well positioned. We loved the apartment. It was very homely and in a sweet part of the old city right under the Cite walls. An easy walk to the medieval ramparts above where there are lots of restaurants - and tourists! About a ten minute walk takes you to a number of restaurants on Rue Trivalle and bars. It's a little way from the town centre (about a 25 minute walk and about a 30 minute walk to the Carcassonne station. The hosts Anna and Ian are easily contactable and very helpful for everything. We really enjoyed staying there. The owners of this property have clearly thought carefully about what to provide their guests. Having previously stayed in static caravans, it was a joy to be somewhere so well-equipped and comfortable. We all enjoyed our stay very much. The children were particularly thrilled by the numerous lizards who inhabit the outer walls of the house on warm nights! Having free wi-fi was an added bonus. The location was perfect for visiting the mediaeval city and near to all the necessary shops and amenities. Above all, the information pack provided by Anna and Ian was brilliant, covering everything we possibly needed to know. We were visiting during the Tour de France so the Garage was such a blessing. Parking in town would have been a nightmare! We arrived later than expected due to issues with our car rental. We called the caretaker to let him know well in advance but he was not happy about it. Thankfully the owner sorted it out for us and we had no issues getting our apartment when we arrived at 10:30 pm. The apartment was well stocked with everything we needed. The ground level where the 2nd bathroom is located had musty smell so we didn’t use that floor during our stay. The upper level had plenty of windows and light. One bathroom was sufficient for our family of 4. Overall, we had a lovely stay. Would definitely stay here again. In the heart of the Occitanie region. 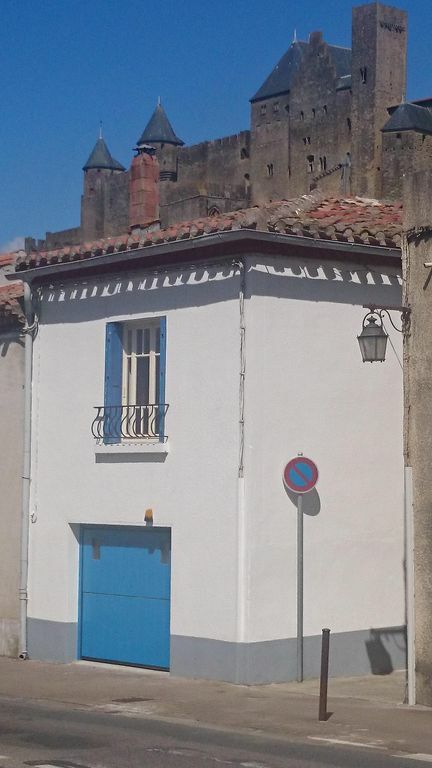 The house is located at the foot of the Carcassonne castle, in just a couple of minutes you are inside the city walls through the Porte de l'Aude, cannot find a mos central location. The house is well equipped, all your needs are covered with comfort. Ian and Anna are great and will answer any question promptly. Highly recommended. At the foot of the medieval Cité (a UNESCO World Heritage site), this house in the historic Barbacane area is ideally placed to explore both the old and new towns of Carcassonne. Two Michelin-starred restaurants are within a few minutes walk and many other excellent local restaurants and cafes are also nearby. The historic old bridge over the River Aude, with its dramatic views of the castle and its ramparts, and the Pyrenees in the distance, is five minutes walk away. A tree-lined stream, ideal either for a short stroll or longer walks is at the end of the road. An open air swimming pool and tennis courts are fifteen minutes walk away. The train station and town centre are within a twenty minute walk with numerous independent shops, restaurants, museums and the town square. Boat trips on the Canal du Midi (also a World Heritage site) are available next to the train station. Internally, the bright bedrooms offer glimpses of the castle ramparts. There is a new shower room with a separate additional shower room. Free wi-fi and (high definition) satellite TV. For the winter months there is a wood-burning stove and electric radiators are throughout. A kitchen/diner/lounge area includes two large settees as well as a breakfast bar with four high chairs (please bear this in mind if you have younger children). The washing machine is in a utility room in the cellar. For those with a car the house also has a private garage. A golf course is 10 minutes drive away as is the beach at the Lac de Cavayere. Toulouse is just over an hour away via the Autoroute and the beaches at the Mediterranean seaside are also around an hour away. Numerous historic villages are less than an hour away including Bram, Villemoustaussou where excellent vineyard tours are available at Domaine O'Vineyards, Pennautier and Aragon. Prices include all taxes, bed linen, towels, cleaning and, if needed, heating. We accept payment in British pounds sterling or Euros.